This Laundry Pair comes in a black stainless steel and comes with a top load washer and electric dryer is designed to get the job done. Get it today and enjoy the best that LG has to offer with a top load washing machine and electric dryer. Make your laundry day more efficient and less stressful with two appliances that are designed to look and work great together. Get it today at RC Willey! When it comes to laundry capacity, big is good, bigger is better, but biggest is best. 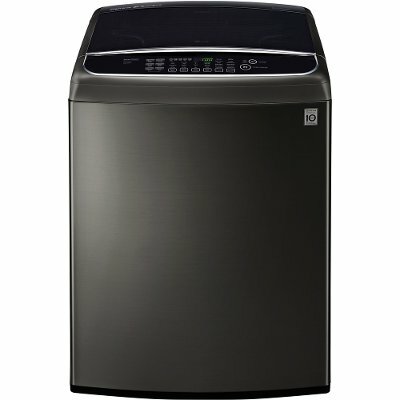 With the largest capacity top load washer in its class this black stainless steel Samsung Washer from RC Willey, now you can wash a king size comforter and full set of bedding in a single load! At 5.0 cu. ft. of mega capacity, you'll definitely have more room to clean. LG puts a modern spin on the traditional top load design. By moving the control panel from the back to the front, the buttons and LED display are easier to read and use. This simple change makes for a more intuitive and functional design and a look that is unlike anything you’ve ever seen.